The plush Two Horizon Centre in Gurgaon has a new addition to its bevy of eateries—Comorin. 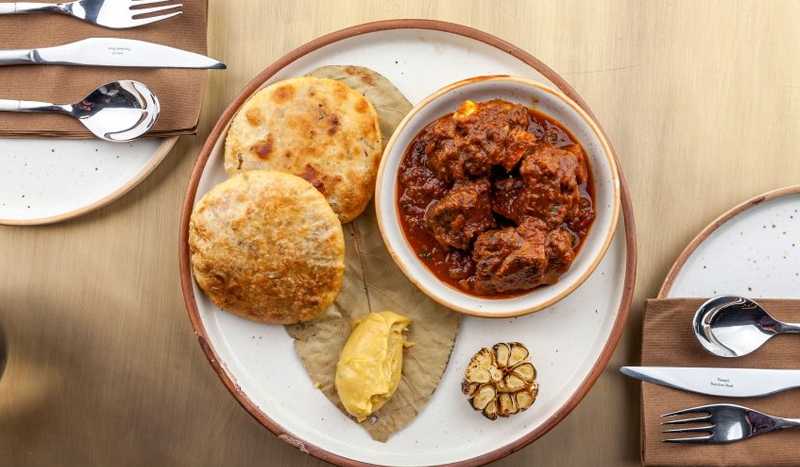 Owned and operated by EVH, part of the Old World Hospitality Group, which counts the iconic Indian Accent restaurants on its roster—Comorin combines an all-day restaurant and a concept store within one space. 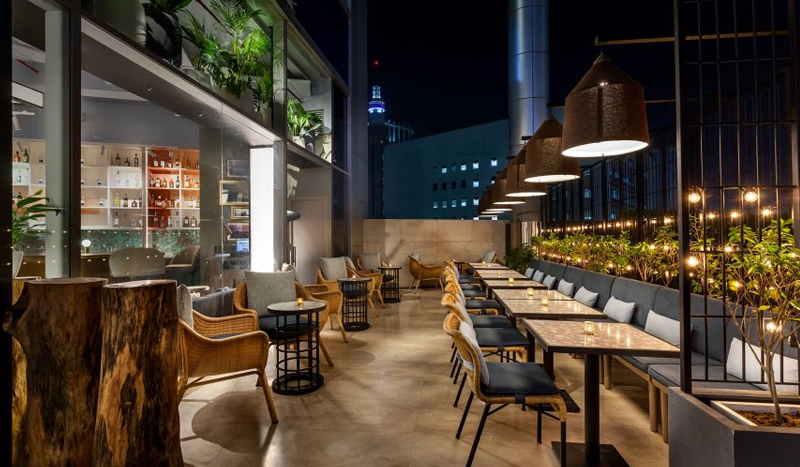 Named after the southernmost tip of India, Kanyakumari or Cape Comorin, as the British had titled it–the restaurant offers a vantage point from where one can look back at the length and breadth of flavours that populate the subcontinent. Comorin’s interior is accented by wood, with a colour scheme that relies on earthy tones, with beige, brown and rust completing the palette. 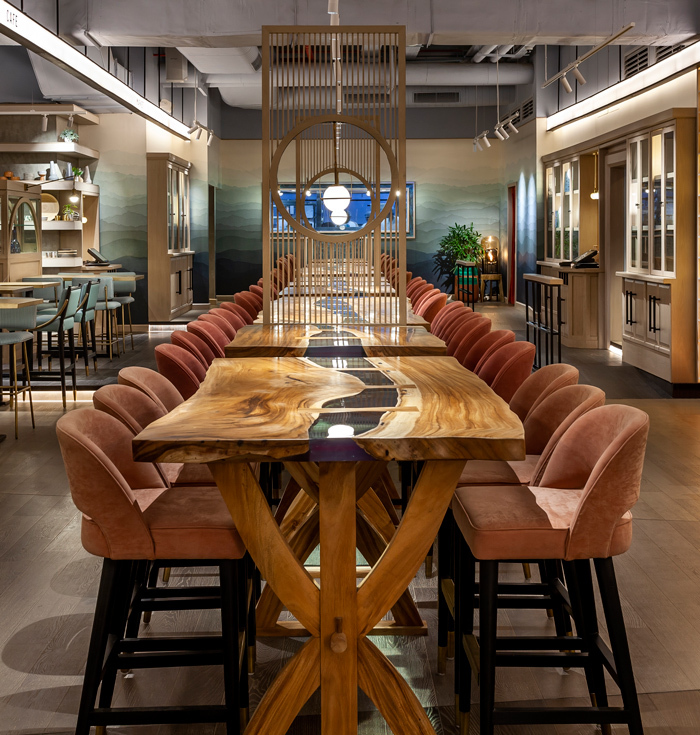 London-based Russel Sage Studio has channeled an extremely relaxed vibe through the warm, muted shades and communal dining seating arrangements. The coffee counter, placed right next to the entrance, holds immense interest to a coffee junkie like me, as it offers the single-estate coffees, sourced from vendors such as Blue Tokai. You can savour these blends, and a choice of teas, at the counter, as takeaways, or buy the roasts from the marketplace. On retail are also seasonal probiotic syrups, kimchi, kombucha, sauerkraut, and more, all customised for Comorin. The dining space is divided into three gradations, and yet the tables have been designed in such a way, that they all seem to be at the same level. For someone standing in one corner of the space, everything seems to be in sync. The atmosphere metamorphoses as the day progresses. There is a genial buzz around lunch time, with executives and professionals from corporate offices nearby coming in for a bite, or simply to browse through the marketplace. As the sunlight fades and the circular lamps overhead light up the space, one sees families come in for a hearty meal. The circle is a motif that can be seen reflected throughout the space. It is used in wooden partitions between tables and to demarcate the various sections, such as the coffee counter and the marketplace. It can also be seen in the shape of the globular lights and in the furnishings as well. Tucked away, at the corner of the highest gradation, is the private dining area. The staff likes to call it a hidden gem, one that you need to discover during your exploration of the space. With a seating capacity of 18-20, it is ideal for intimate gatherings. 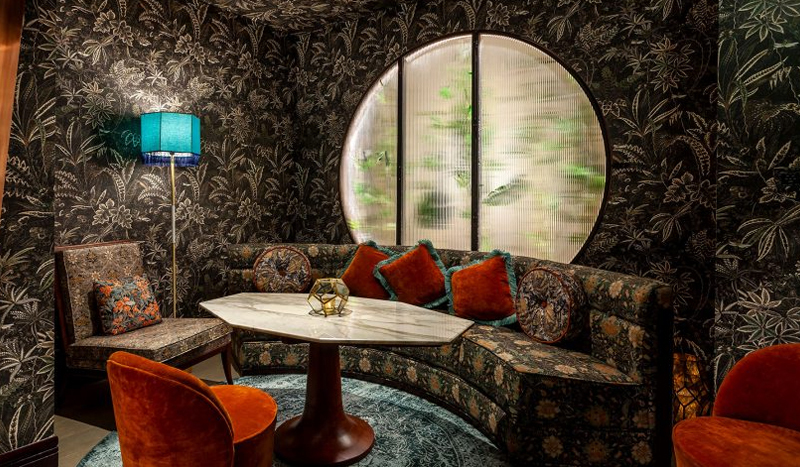 Here, the interiors acquire jewel accents, with floral motifs on the walls and seating. 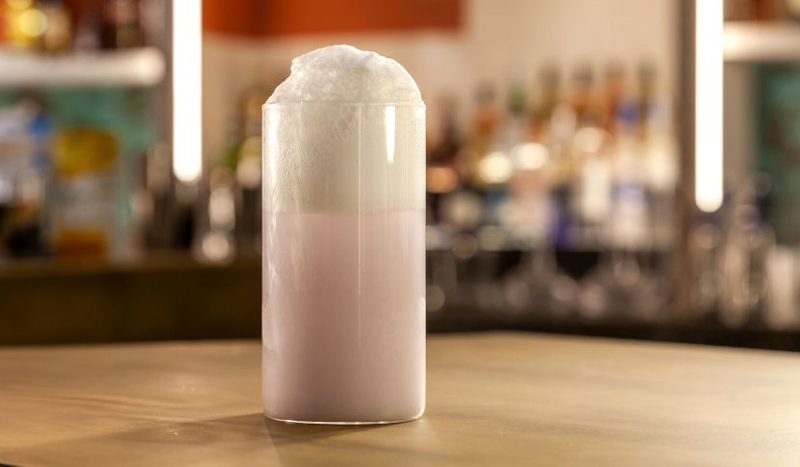 One of the highlights of the space is the bar, with its wide selection of spirits, but the most unique part is the sous-vide counter, where vodkas and gins are infused with aromatics such as juniper, khus, rose, and hibiscus. The bar chef also offers bottled cocktails and mocktails, made with house liquors such as dark khus vermouth, fennel liqueur, walnut bourbon and vanilla cognac. The bar and the food menu seem to be perfectly in sync, with focus on seasonal, regional and local seen in both. Crafted under the expert eye of Manish Mehrotra, EVH’s consulting chef for the restaurant, the menu – divided into small, large and extra-large plates — features comfort dishes, touches of nostalgia and innovative flavour combinations. Plated under the supervision of Executive Chef Dhiraj Dargan, each dish evokes the diversity of Indian flavours. Some of the standouts include sweet corn khichdi, with sweet hints and sem ki beej for texture; and the tart Andhra Gongura Chicken, which does full justice to this seasonal green and with a crisp murukku offering a contrast. Two of our favourites were the flavourful and smooth Haleem, which you can scoop up with a butter toast, and the Kanyakumari Crab Claws, in which the sweet meat and the freshness of spices create quite a mélange of flavours. For a cool wintry afternoon, nothing works better than the hearty Champaran meat served with sattu paratha and chutney. It’s a dish that you usually find in home kitchens, and rarely on restaurant menus, and it’s one that should not be missed. And if you still have space for more, there is the Cheeni Malai Toast, warm brioche slathered with malai and served with honeycomb. Comorin is a must-visit in case you are looking for a relaxed, wholesome experience, with a finely crafted meal.